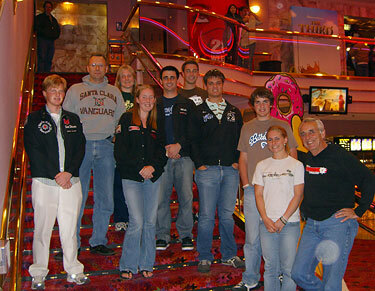 Fans who attended the 2007 DCI Classic Countdown, Drum Corps International's annual spring cinema event, shared these pictures with DCI.org. These pictures are of me (the guy in the makeup) and my two buddies, Michael Prendes and Steven Prendes. Steve is the one with the shades. We all live in Gainesville, Fla., and we went to Regal Cinemas for the show. Great Countdown lineup! I decided to dress up and show my support for my favorite drum corps, the Cavaliers. 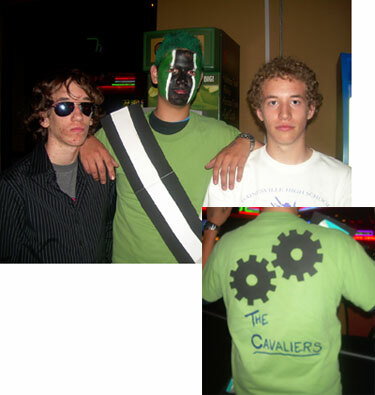 I actually auditioned for the 2007 Cavaliers, unfortunately I was cut at the final audition camp. Anyway, I still love them and I plan to audition again for the 2008 season. I can't wait! 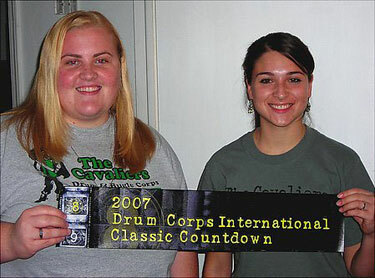 Here are some pictures of members of Denver's first and only all-age senior drum and bugle corps, the High Country Brass, attending the 2007 DCI Classic Countdown. 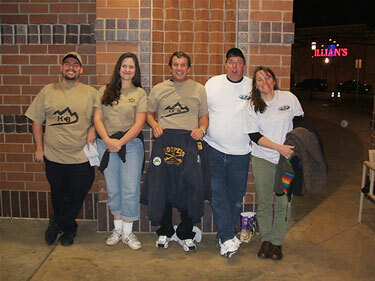 We went to the United Artists Theater at the Colorado Mills Mall and met up with lots of other corps fans. I went see the 2007 Classic Countdown with my best friend, Rebecca. We had so much fun. Neither of us had seen almost half of the shows in the Countdown, so it was a great experience for both of us. I can't wait until next year! The picture is of Rebecca on the right and me on the left after we got home from the theater. The theater manager let me take home the movie poster. It'll be going up in our dorm room come the fall semester. All in all, a great night of drum corps. Thanks DCI! This is me and my buddy Keith outside the 2007 Classic Countdown in Times Square in New York City. We both marched in the Blue Devils; Keith in 1995, 1997 and 1999, and me in 1999, 2002 and 2003. Just a portion of the happy drum corps nuts who showed up in Santa Maria, Calif., including Chris Thorsen, a 1989 member of Santa Clara Vanguard; Scott Schroeder, the current Vanguard Cadets drum major; and Erin Stearns, a 2006 member of Phantom Regiment.